Corran Tuathail - For information on walking and climbing routes on Ireland's highest mountain click here. Mt Brandon - Rising over 3000ft directly from the Atlantic Ocean, Mt Brandon offers incredible views of the Dingle Peninsula and Ireland's west coast. 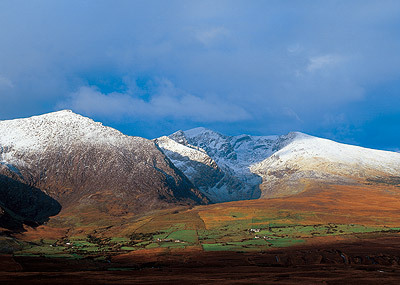 The mountain forms an impressive ridge running from the Conor Pass northwards to the sea at Sas Creek, with impressive cliffs on its eastern flanks and gentler slopes to the west. Mount Brandon has something to offer both novice and fit experienced walkers alike - Guided ascents with group rates from €150. Slieve League - The summit of Ireland's highest seacliff is the jewel in the crown of Donegal's walking routes. 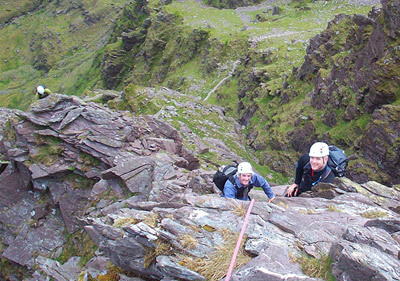 Although the walk is suitable for all levels the exposed passage along 'One Mans Path' is sure to get the heart racing - Guided ascents with group rates from €150. The Twelve Bens - Any visitor to Connemara should take the opportunity to explore these rugged quartzite mountains. From gentle walks through the Inagh valley and along The Western Way, to the tough challenge of the Glencoaghan Horseshoe, one of Ireland's great walks, there is something here for everyone - Guided ascents with group rates from €150. With the right approach, realistic challenges, and a healthy dose of enthusiasm hillwalking can be enjoyed by all ages - from children to grandparents! Let us help you find walks you can along enjoy while exploring mountains, lakes, and ancient forests. Interested?... get in touch and we can discuss and design a walk to suit your family. Are you seeking a new challenge in your walking? While there are endless possibilities for venues and walks, there are some routes which have gained a special status in walking lore. The Coomloughra Horseshoe - Located in the McGillycuddy Reeks, this walk has all that hillwalking can offer. Magnificent views of mountains, lakes and ocean, challenging terrain with a little bit of scrambling and exposure, and perhaps most importantly the opportunity to climb Ireland's 2 highest mountains. The Glencoaghan Horseshoe - Galways answer to Kerry's Coomloughra! The mountains here are not as high as Kerrys finest but the challenge or experience is certainly not diminished. Taking in 6 of the 12 Bens, this walk offers quite a physical challenge. The rewards however are abundant, as much in the satisfaction of completing one a classic route as in the rugged terrain and beautiful views of Connemara with its dramatic mountains and coastline. The Mournes Seven Sevens - Taking in the seven 700m summits and mountain tops of the Mourne Mountains, and at almost 30km in length, this is certainly a walk (or run!) that is not for the fainthearted! The Four Peaks - Loved by charities, this challenge gives you the opportunity to climb the highest mountain in each of Irelands four provinces. Corrantuathail, Mweelrea, Lugnagquilla, and Slieve Donard are all within the compass of novice walkers. With a little bit of guidance they can be completed over a long weekend, or at a more leisurely (and maybe more enjoyable!) pace. 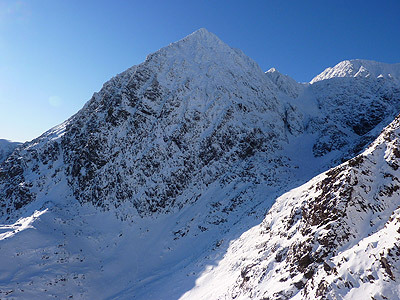 The McGillycuddy Reeks Ridge - Traversing the spine of Ireland's highest mountain range will leave a lasting impression. The route between Kate Kearneys and Lough Acoose in Glencar offers spectacular walking, with a little bit of scrambling. That creamy pint by the fire in Kate's afterwards will never taste so satisfying! All of the above walks can be guided and arranged for you. Please get in touch to discuss details and rates. This is the official training course of Bord Oiliunt Sleibhte (BOS - the Irish Mountain Training Board). The course is intended for those who which to become independant walkers, proficient in mountain navigation, safety and ultimately able to look after themselves in the Irish hills and mountains. The course is recognised by Mountain Rescue Teams, FETAC and other bodies. The course is usually split into 2 modules known as Mountain Skills 1 and 2 (MS1, MS2). For more information on course content see www.mountaineering.ie/trainingandsafety/viewdetails.asp. Courses are available from €100 per person depending on venue, group size etc. Please get in touch to discuss this further. Can you identify specific areas of your mountaineering and/or hillwalking skills that you would like to improve or develop? If so we can provide a course specific to your needs. Common areas of concern are compass navigation, both by day and by night, steep ground and scrambling, and what to do in the event of accidents. If you would like to enhance your abilities, become an independent hillwalker or simply broaden your horizons, then get in touch and we can see how we can help you. Do keep in my mind that for training and learning (and economics!) groups of 4 to 6 people often offer the best results through group dynamic and feedback. For many walkers there is a natural progression through increasingly challenging walks into the steeper realm of Scrambling. Becoming a competent 'scrambler' can open up a whole new approach to steeper and rockier mountains of Ireland, Britain and beyond. Few will spend time in the company of Irish mountaineers without hearing of 'Howling Ridge' or 'Carrot Ridge' . These, and other, spectacular routes definitely require a head for heights but the climbing skills required are within most people abilities. Join us for a guided ascent of a classic climb or indeed on a training course to prepare you to tackle them yourself. Click here for more information on scrambling.